“Why did you chose here – we are stood on a main road”. My partner was once again spot on with her observation. We were indeed on the edge of one of London’s busiest roads, Euston Road to be precise. Significantly however, we were not just standing, but holding a drink and no ordinary drink at that. I went on the defensive, “the thing is” I started in a reassuring tone, “it’s not just about the beer, there are some other very good reasons why one might frequent the Euston Tap that has nothing to do with beer”. She looked at me as if I was bullshitting again. I sipped my pint and tried to justify taking my non-beer drinking partner to the best beer drinking pub in London. Few people would choose to drink at the Euston Tap for its location – that much I will concede. During the two hours we were stood outside I counted well over 10 sirens scream pass. Combine this with a healthy dose of London’s finest air pollution and I will confess there are nicer places to enjoy a pint. 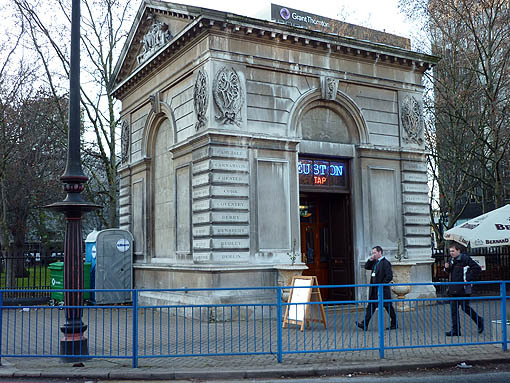 A few punters might be interested that the bar is housed in a Grade II listed building, one of the few relics from the original Euston station built in the 1830s. A few, but let’s be honest, not that many and I suspect not my partner. The reason, I (and one or two others) chose to frequent the Euston Tap is simple – an unrivalled selection of varying quality beers. When I visited they had 19 beers on tap (8 cask ales always on rotation) – a feat which, to my knowledge, is unmatched anywhere in the capital. I went for Mallinson’s ‘Danger Hops’ – a hard headed pale ale with a sweet nose followed by an (exceptionally) long hoppy finish. I mention this purely to illustrate how the bar can open up your world of beer drinking….when else would I sample and ale from a micro-brewery in Huddersfield? As if this isn’t impressive enough they have an additional 150 bottled beers from around the world in stock at any one time. Even the most seasoned of beer drinkers would struggle to not find something new here. Every time I have visited they have had at least one beer on tap that I have not tasted before. As I said however, this compelling beer argument is not enough to attract the likes of my partner. There is more to the Euston Tap though. It is a combination of little quirks which gives the place some character. What other bar would only have one toilet? What other pub marks all of its (constantly rotating) beers up on chalk boards above the bar? What other bar staff will take the time (regardless of the length of queue) and talk you through the beer they have on tap? Few, if any I would suggest. This article is a virtual clink of glasses from me to the Euston Tap. A bar that dares to do it differently, that has broken out of the “next to a train station and all we sell is Carlsberg conformity”. I and other London based beer lover will continue to flock there. Whether or not it has done enough to attract non beer drinkers like my partner remains to be seen – I got a sneaky feeling it hadn’t. The lure of such a great selection of beers is a good reason to stray off the beaten path and experience something new. However, once in the grip of lacklustre bar staff, no good beer can overcome the crowd of stuffy businessmen and commuters, noisy traffic, and bad service that i experienced at The Tap. The ‘Jever’ beer I chose is a favourite of mine, but it tasted flat and the lines did not taste very clean. It is like giving a black truffle to a KFC fry cook, it might be a great ingredient, but in untrained hands it is ruined. A shame – go to a good shop and buy a nice bottle of craft beer, the Euston Tap cannot overcome a shabby location with great beer in its current guise. Hear hear! I thoroughly recommend the Cider Tap too. Drink there Monday? It would be rude not to as we will be so close!